The mansion is a three storey mansion which was custom built in 2001 and features six bedrooms, nine bathrooms, formal living room, stone wine cellar, elevator, game room and dining room with a seating capacity of eighteen people. It offers some awesome water views from almost every room providing a great feeling of serenity. Some of the other impressive features of the mansion are sunrooms, nurseries, pool house, gym and a custom built la Cornue kitchen. 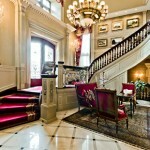 Also the mansion is secured by a gated bridge with a security post. 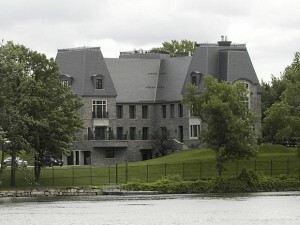 According to Sotheby’s International Realty Canada this mansion has become the most expensive residential home listed for sale in Quebec as it overtakes the $27-million TuLyons residence.